#1. This week's number one is an experienced former international power forward Francisco Centeno (203-85, currently plays in Chile). He could not help AB Ancud (0-2) in their last game. Despite Centeno's very good performance the first-placed AB Ancud (0-2) lost 68-79 at home to the leading Las Animas in the Conferencia Sur. He was the top scorer with 18 points. Centeno also added 4 rebounds and dished 4 assists in 29 minutes on the court. Centeno has relatively good stats this year: 11.7ppg, 5.8rpg, 2.5apg, 2FGP: 55.6%(25-45), 3FGP: 25.0% and FT: 61.1% in six games he played so far. He played for the Venezuelan senior national team seven years ago. #2. Second place goes to an international center Windi Graterol (204-86, agency: Pro Sports, currently plays in Brazil). Graterol was the major contributor in Brasilia's victory against the league outsider Joinville (4-18) 98-90 in the Brazilian NBB last Thursday. He recorded 19 points, 5 rebounds and 3 assists. Universo/Caixa/Brasilia (7-14) is placed 12th in the NBB. It's Graterol's first season with the team. This year Graterol has relatively solid stats: 13.0ppg, 6.8rpg, 2FGP: 59.8%(101-169), 3FGP: 26.5% and FT: 64.6%. Ex-Cocodrilos de Caracas player is in the roster of the Venezuelan senior national team. #3. The Venezuelan player who performed third best last week abroad was an international center Gregory Echenique (206-90, agency: Pensack Sports, college: Creighton, currently plays in Japan). 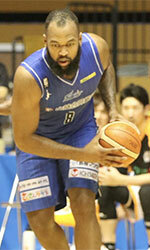 He was not able to help Shimane Magic (31-13) in their last game. Despite Echenique's good performance Shimane Magic (#2) was badly defeated 86-70 on the road by the leading Gunma in the West group. He had a double-double by scoring 12 points and getting 15 rebounds. Echenique also added 3 assists in 35 minutes. Echenique has individually a very good year with high stats. He averages: 18.9ppg, 14.2rpg, 2.5apg, 1.5bpg, 2FGP: 62.6%(306-489) and FT: 74.8% in 42 games. Echenique is also a member of the Venezuelan senior national team. #4. Center Luis Julio (201-80, currently plays in Chile) led Aleman to a victory against the second-ranked Deportivo Valdivia (20-12) 72-67 in the Chilean Liga Nacional in Saturday night's game. He scored 11 points and grabbed 9 rebounds. It was the game of the round between two top 3 ranked teams in group Conferencia Sur. CD Aleman Puerto Varas Concepcion (18-14) is placed third in Conferencia Sur. It was his team's fifth consecutive victory in a row. Julio has reliable stats this season: 14.3ppg, 9.8rpg and 2.5apg. He has a dual citizenship: Colombian and Venezuelan. Julio used to play for the Venezuelan national team back in 2009. #5. International swingman Dwight Lewis (197-87, college: USC, currently plays in Argentina) contributed to Gimnasia's victory against one of league's weakest teams Argentino (4-14) 97-89 in the Argentinian La Liga last Saturday. He scored 10 points in 27 minutes. Gimnasia y Esgrima Comodoro Rivadavia (11-6) is placed fifth in the La Liga. Lewis' stats this year are: 13.2ppg, 2.6rpg and 1.9apg in 17 games. He is a naturalized American. Lewis plays currently for the Venezuelan national team. He used to play for Trotamundos de Carabobo in Venezuelan league. #6. Swingman Pedro Chourio (186-90, also represented by Pro Sports, currently plays in Argentina) was not able to secure a victory for Estudiantes Concordia (7-10) in their last game on Friday. Despite Chourio's good performance Estudiantes Concordia was defeated 86-82 in Mercedes by the higher-ranked Comunicaciones (#11). He scored 11 points and grabbed 5 rebounds. Chourio's overall stats this season are: 8.3ppg, 4.3rpg and 1.1spg. He is an international player who is currently on the senior Venezuelan National Team roster. #7. International guard Jhornan Zamora (196-89, currently plays in Spain) contributed to an easy victory against the ninth-ranked Magia Huesca (14-10) 78-62 in the Spanish LEB Gold (second division) in Saturday night's game. Zamora scored 13 points and added 3 passes in 25 minutes. Rio Ourense Termal (15-9) is placed fifth in the LEB Gold. Zamora has very impressive stats this year: 15.7ppg, 3.0rpg, 2.0apg and 1.3spg in 22 games. He is also Venezuelan national team player. #8. Point guard John Cox (195-81, another player represented by Pensack Sports, college: USF, currently plays in France) managed to help Sluc Nancy Basket Pro in a victory against one of league's weakest teams Caen (5-14) 67-53 in the French ProB (second division) on Friday night. He recorded only 4 points and added 3 assists in 20 minutes. Sluc Nancy Basket Pro (14-5) is placed second in the ProB. It was his team's seventh consecutive victory in a row. Cox averaged so far 11.3ppg, 1.8rpg and 2.6apg in 19 games. He is a naturalized American. Cox used to play for the Venezuelan national team back in 2017. He played also for Marinos de Anzoategui in Venezuelan league. #9. Former international forward Luis Valera (202-88, college: UTRGV, currently plays in Spain) couldn't help Azuqueca (11-12) in their last game on Wednesday. Despite Valera's good performance Azuqueca (#6) was defeated 71-66 in Santander by the higher-ranked Estela (#3) in the East group. He was the second best scorer with 14 points. Valera also added 4 rebounds. Valera's overall stats this season are: 8.4ppg and 3.3rpg. He used to play for the Venezuelan national team four years ago. #10. Point guard Harold Cazorla (175-91, currently plays in Spain) couldn't help Fontedoso Carrefour (9-14) in their game against La Roda (7-16) in the Spanish LEB Silver (third division). Cazorla cannot count Wednesday's game as one of the best ones. He scored only 2 points in 17 minutes. Fontedoso Carrefour (#10) was badly defeated 81-62 in La Roda by the lower-ranked (#11) La Roda in the West group. This year Cazorla's overall stats are: 9.5ppg, 4.0rpg, 4.9apg and 2.3spg in 22 games. He is a former international player as two years ago he still played for the Venezuelan senior national team. #1. Osbel Caraballo (196-F-98, currently plays in NCAA2) led St. Thomas Aquinas College to an easy victory against the Roberts Wesleyan College crushing them 90-64 in the NCAA2 last Sunday. Caraballo recorded 18 points and grabbed 6 rebounds. The St. Thomas Aquinas College has record this season. 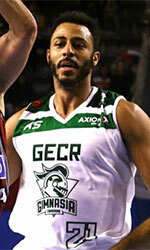 Caraballo averaged so far 13.4ppg and 6.8rpg.